One of my side projects includes tallying Asian writers. Specifically, I tally the bylines set aside to Asian writers in mainstream Buddhist publications. 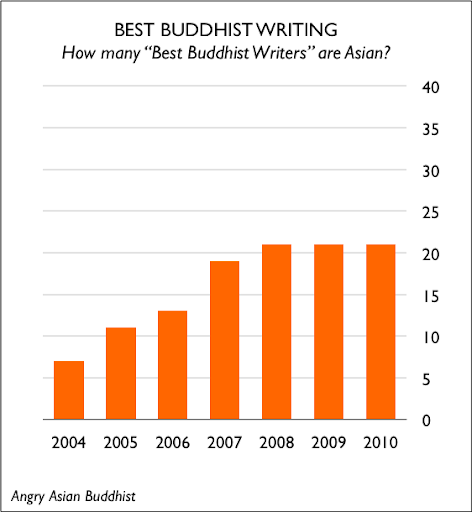 Early last year, I investigated The Best Buddhist Writing series and came away with the following three conclusions: Asians are underrepresented in the anthology (about 19 percent of authors), most of these Asian writers tended to be Tibetan, and the Asian authors reappear in the pages more frequently than their non-Asian counterparts (who make up a much larger, mostly white pool). 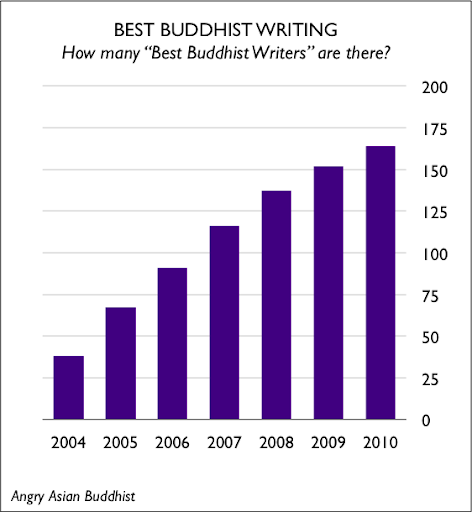 A few weeks back, I updated my “database” to include The Best Buddhist Writing for 2009 and 2010. Little surprise, the running average remains almost exactly the same, at 19.2 percent. But I’ve been more interested in a different statistic. It turns out that the editors of The Best Buddhist Writing choose from a very small pool of Asian authors. Out of 163 authors who have ever appeared in its pages, a mere 21 have been Asian, accounting for 46 bylines. Now, the real shock came when I tried to answer the question: How many new Asian Authors join each year? Over the past two years—none! 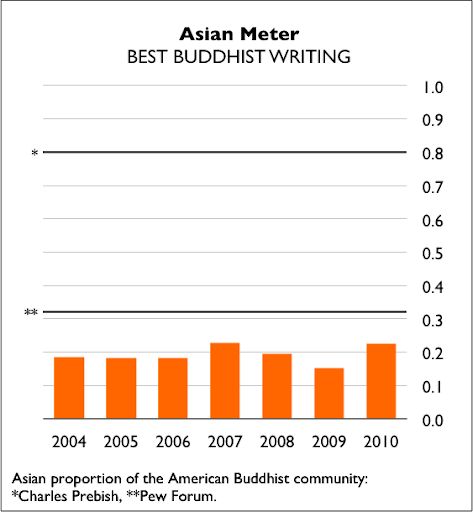 The number of Asian authors—those who had ever had their work published in The Best Buddhist Writing—increased each year until 2008, where it plateaued at 21. In 2009 and 2010, the Asian authors all had also been published in previous volumes. In contrast, the number of total writers keeps on growing, as new non-Asian authors continue to be added to the mix. The Best Buddhist Writing 2010 is the newest edition and currently on the bookshelves. You can check out a very positive review at the Buddhist Blog.